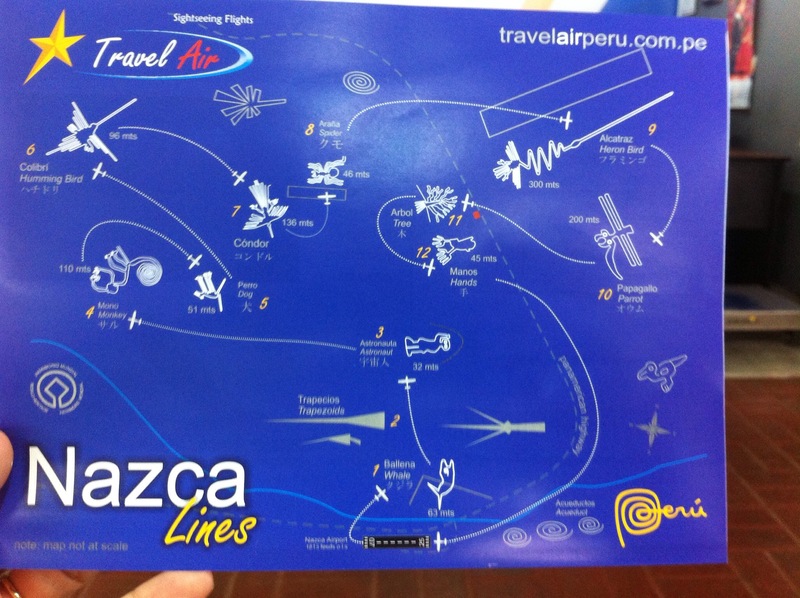 It was Tuesday, February 17 (Mardi Gras) when we landed at Iquitos, Peru. Reachable only by air or river, there are no roads connecting Iquitos to any other town or city! Our next stop was by boat. 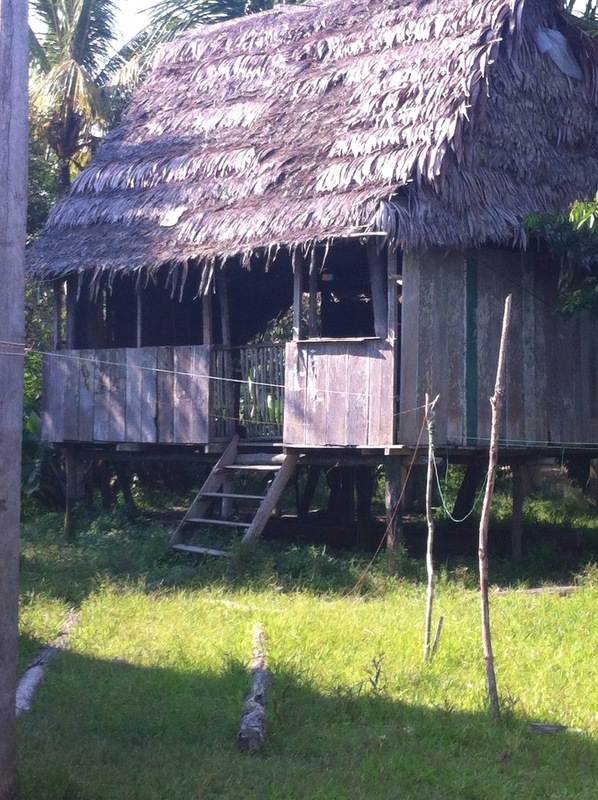 Leaving Iquitos, our motor boat sailed 2 1/2 hours along the Amazon River and one of its tributaries to reach our lodge. The rainy season began a month ago, so the ground along the river bank is flooded. 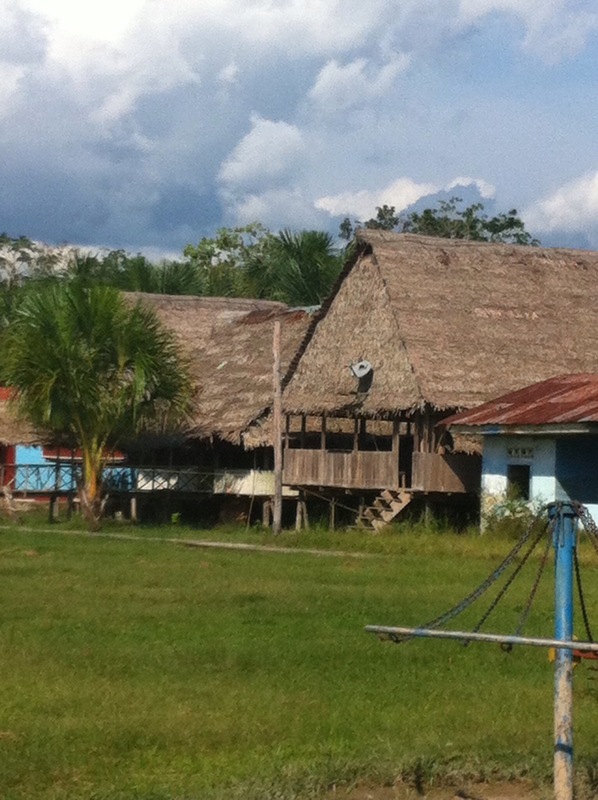 The thatched buildings are all raised on stilts, so the water flows underneath. After lunch and a short rest, we, and the other two guests at the lodge, a pair of British backpackers went out with a guide to do some wildlife spotting in a boat. After an hour or so, we began to return to the lodge, but heard drumming coming from nearby. The guide detoured to the local village, El Chino, where there was great excitement. A Carnaval tree had been set up in the center of the village. 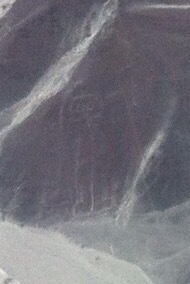 This consisted of a tall, thin tree trunk, with four curved branches made into two ovals at the top. From these ovals, brightly colored plastic dishes, cups, and containers were hung, along with cloth of every color, new dish towels, table clothes, and t-shirts tied to the tree. Beneath the tree, the ground had been saturated, to make a mud pit. The younger villagers, children, teenagers, and young adults were dancing around the tree, like a May pole, while the older ones watched. As the drumming continued, the dancers circled the tree counterclockwise, holding hands in groups of 3 or 4. They went faster, and faster until people began to slip and fall in the mud. When the drumming stopped, the game was to pour or rub mud onto participants until they were covered. If a friend was spotted outside the circle, not joining the game, they were likely to be smeared in mud as well, with a great deal of laughing. When the drumming restarted, so did the dancing. After watching a few minutes, we were invited to join. Dad and the backpackers ran right in, though Boy was a bit shy, and preferred to stand back and watch, so I kept him company and took the photos. Once completely covered in mud, Dad came over and gave us a big hug, sharing quite a bit of mud in the process. We did not stay till darkness fell, leaving instead about sunset. Our guide explained this happens once a year to celebrate Carnaval, the party before the beginning of Lent. When it is too dark to continue, the Carnaval tree is cut down with a machete and the muddy participants scramble for the prizes, like a piñata. It was like no other Carnaval party I have ever experienced. 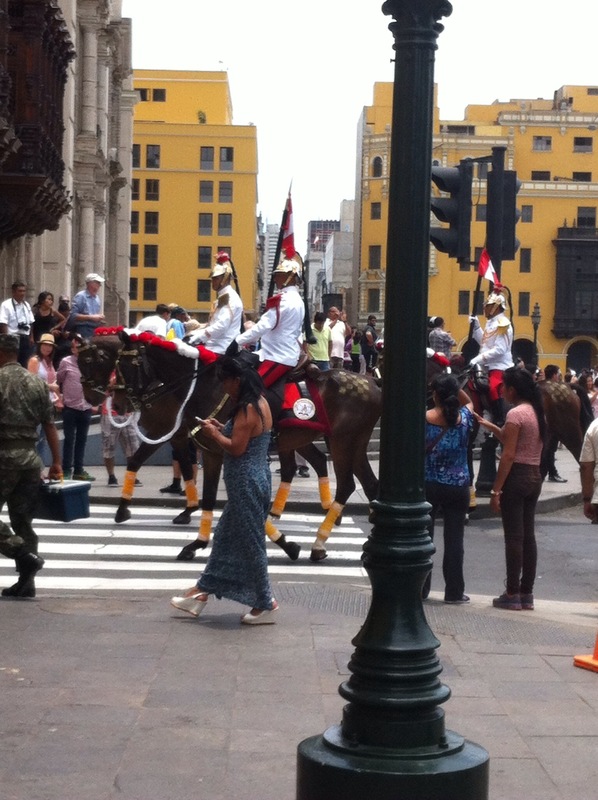 We had heard Lima was a city to miss. Many travellers make it only an overnight stopover on the way to Cusco. Undeterred, we planned four days here, though it was shorter than our usual city stays. 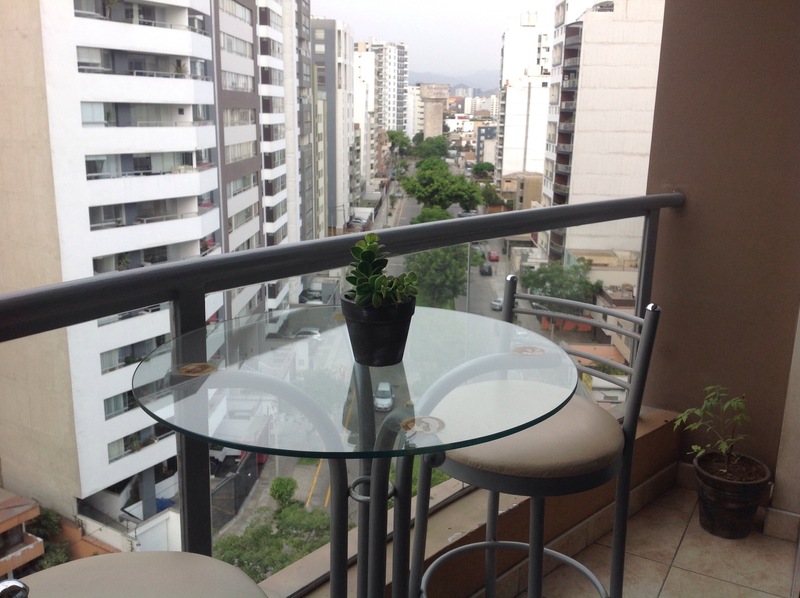 Our apartment was in Surquillo, a residential neighborhood next to the more fashionable Miraflores. Giving us a view of the mountains and the financial district, the spot was comfortable for relaxing, though a bit far out from the tourist stops. Taxis took us into the city for sightseeing, though the first thing we noticed was the traffic. We laughed when the GPS told us it would be 29 minutes to go 12 kilometers, but in fact the GPS estimate was low. It took longer. Multiple times we found intersections gridlocked as lights changed, but cars continued to push through, frustrated by the long wait and blocking cars coming from the other direction. 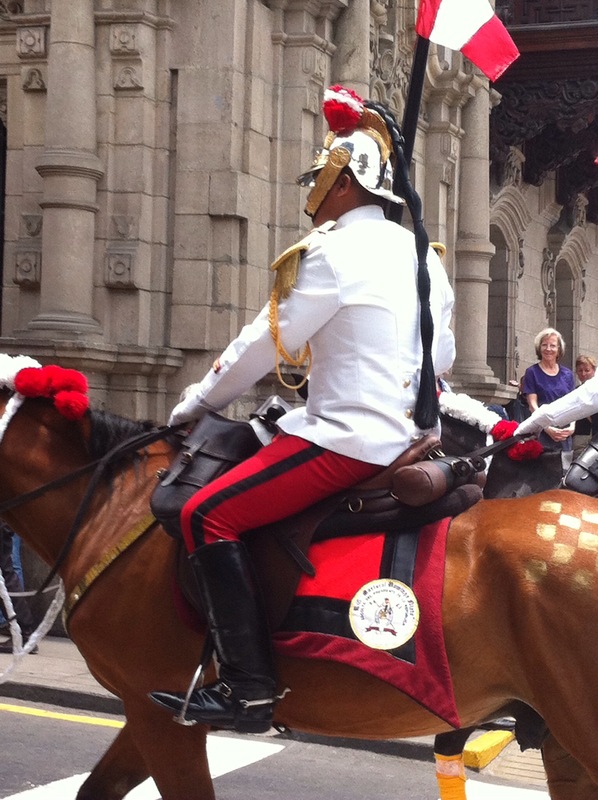 In the main square, the Plaza Mayor, also known as Plaza de Armas, we watched the cavalry parade in front of the governors palace. 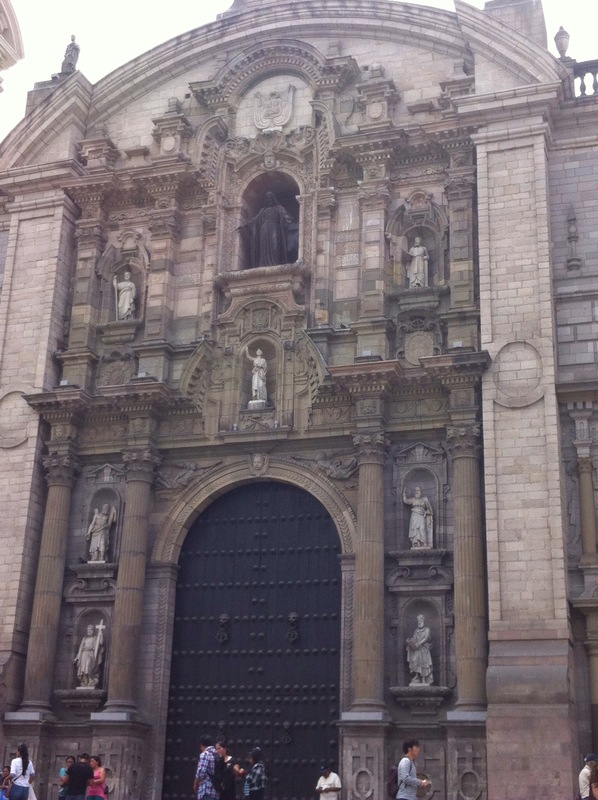 The plaza is also home to the cathedral, built by the conquistador Francisco Pizzaro in 1535 when Lima was founded. The cathedral was closed while we were there, but is home to Pizzaro’s tomb. We strolled to the Monastery of St Francis a few blocks away where we saw a painting of the last supper depicting traditional Inca foods, such as guinea pig and chicha beer. The catacombs under the church are known for the skulls and leg bones arranged in geometric patterns. Also located a few blocks from the plaza is the intriguingly named Casa De La Gastronomia Peruana. 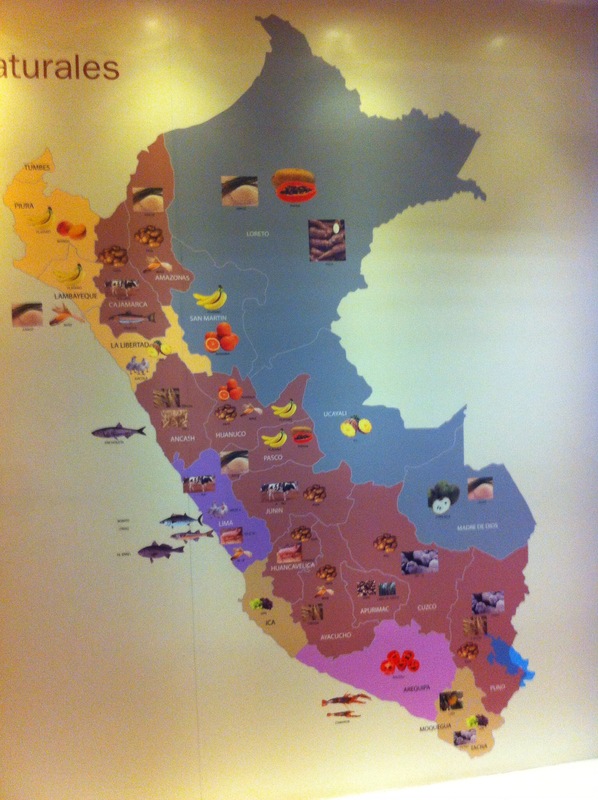 This is a food museum showing the foods produced in the different regions of Peru and how they have been used and cooked throughout history. The permanent collection includes cook wear and pottery, as well as full scale models of historical kitchens from Precolumbian times through the 20th century. 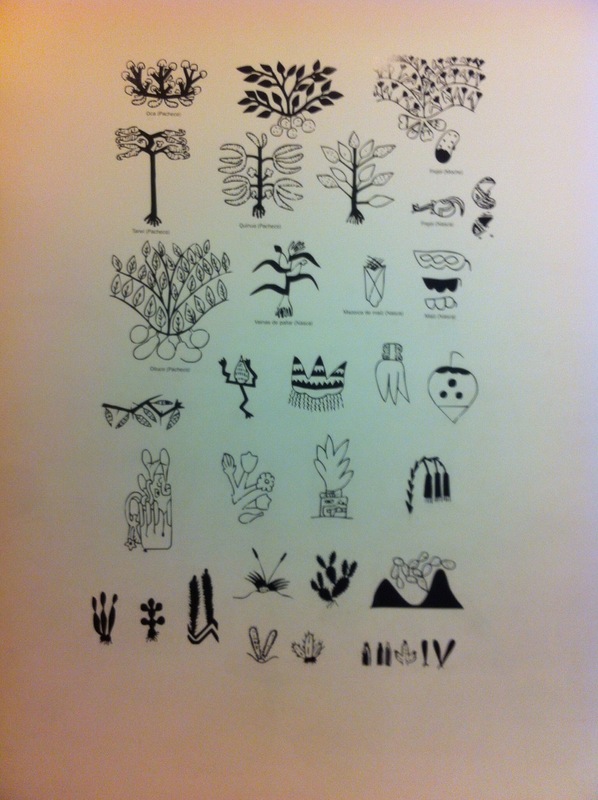 Dad quite liked the temporary exhibit on the history of Pisco and the Pisco Sour. Not willing to miss an archeology museum, I dragged the crew to two while we were in Lima. 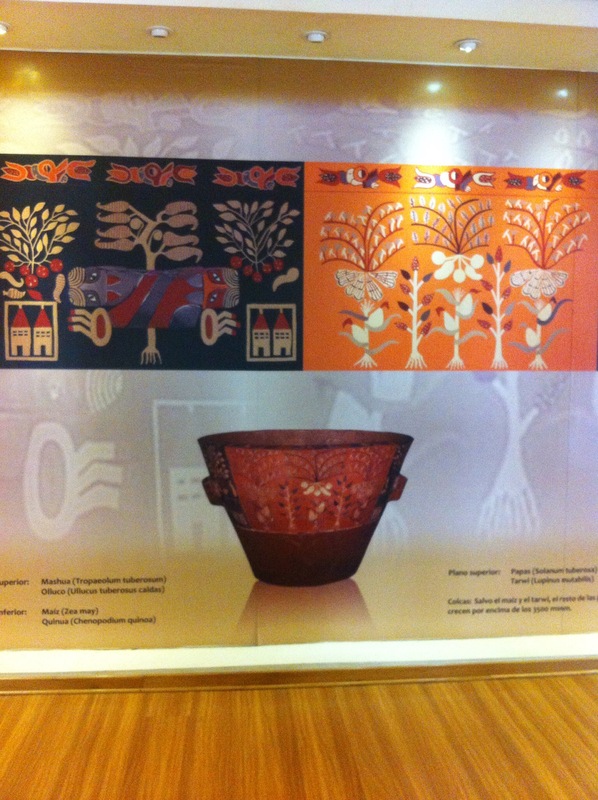 The first was the Museo Nacional de Arqueologia, Antropologia e Historian del Peru. The building is in the Pueblo Libre neighborhood and was once home to San Martin and Bolivar, the leaders in the Revolution against Spain. 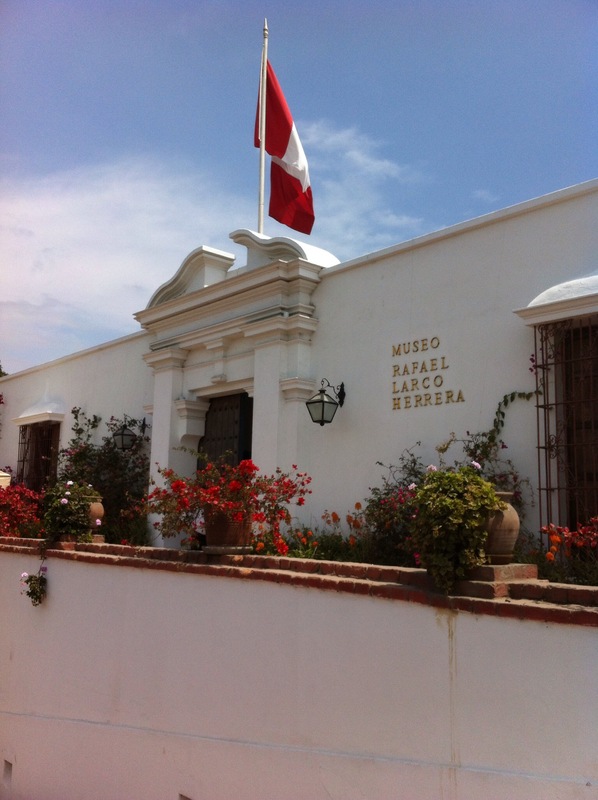 The museum’s building looked a bit worn, but inside held an impressive, modern exhibit on the PreColumbian cultures of Peru, including an outstanding exhibition on the mummies of the desert. Boy was not fond of the mummies and preferred to leave that section as quickly as possible, though the museum had done a nice job developing some children’s hands on activities corresponding with the exhibit. Leaving the Museo Nacional Arqueologia we found the blue line painted on the sidewalk and followed it about 1.5 kilometers to the Museo Arqueologia Rafael Larco Herrera. This large, well funded museum housed in an 18th century mansion showcases a private collection of an artist and collector. 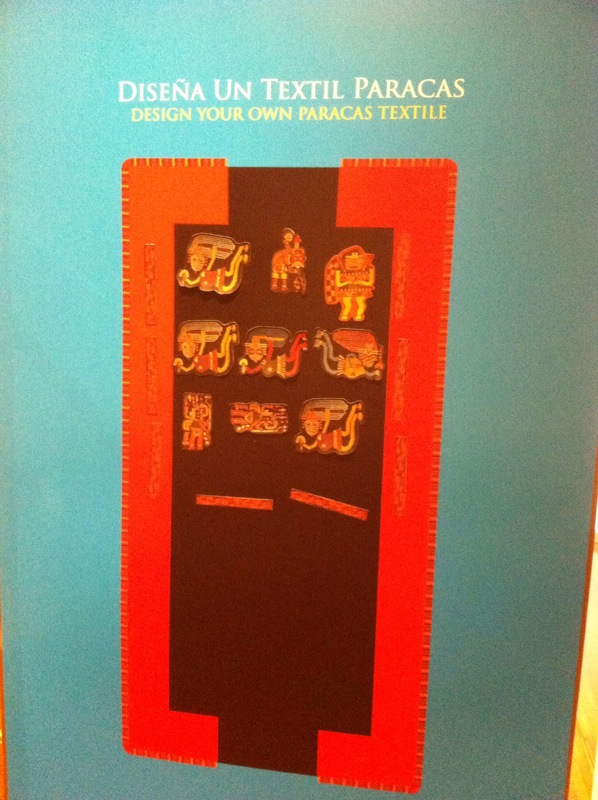 The wide ranging collection covers 3000 years of Peruvian history, with well preserved examples of ceramics, metalwork, weavings, quipus, and gold. 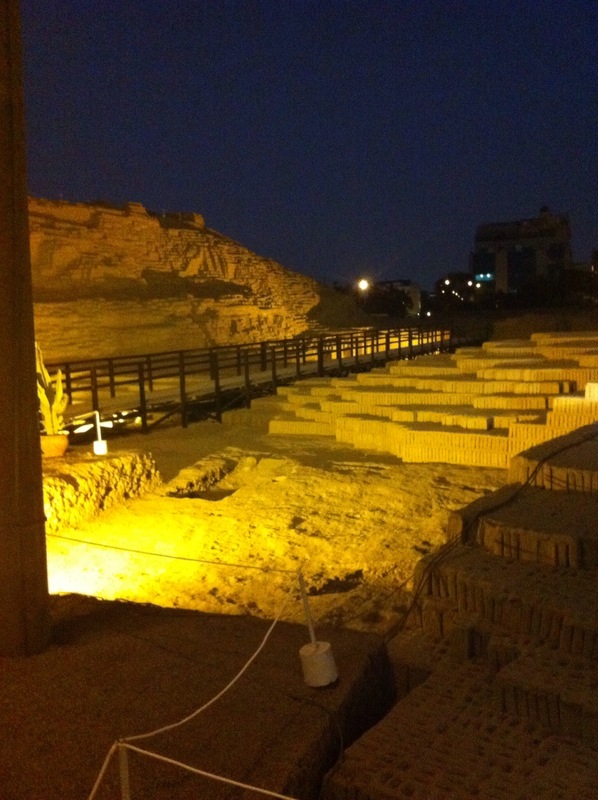 Our final archeology stop was the pre-Incan ruins of Huaca Pucllana. 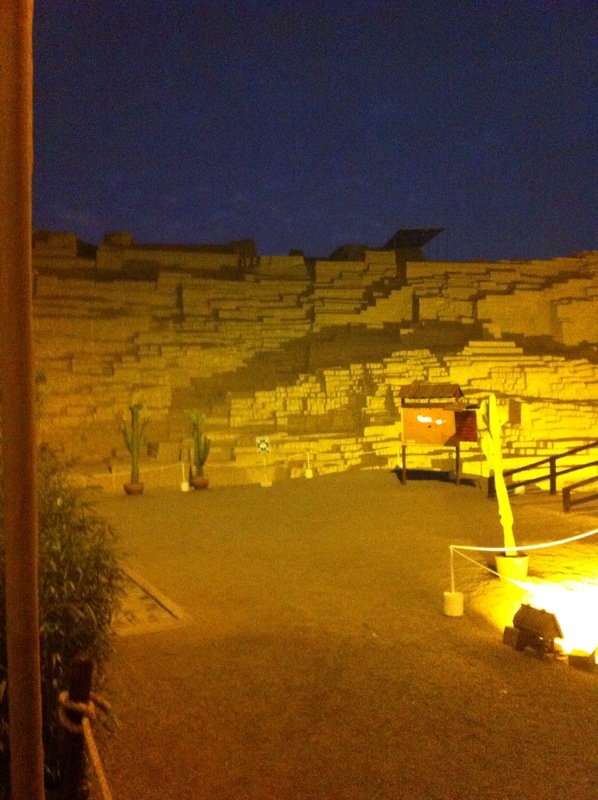 Dating from about 500 AD, the pyramid is made of mud bricks and was a ceremonial center for hundreds of years. Now it is home to a restaurant that overlooks the ruins, where groups of tourists make offerings of flashes of light while they illuminate their selfies. 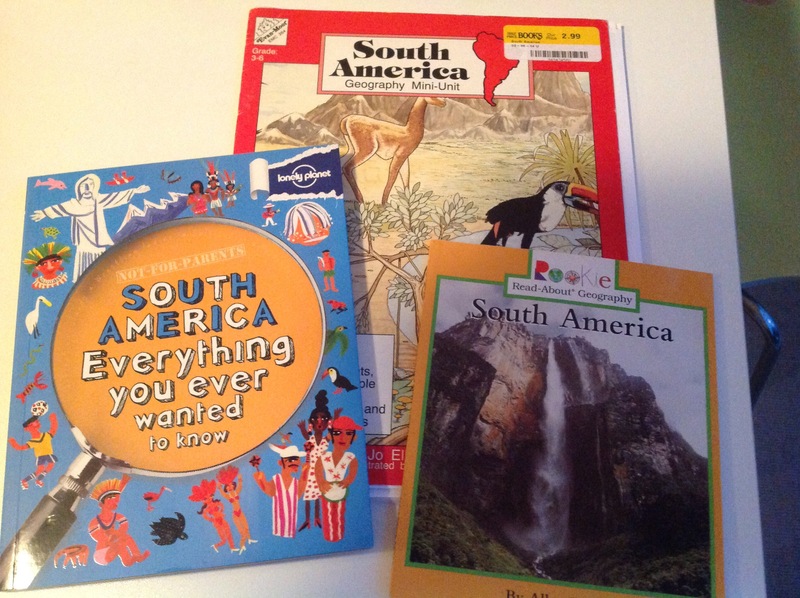 Our schoolwork this week has been themed around Pizarro, the conquistador and founder of the city of Lima. 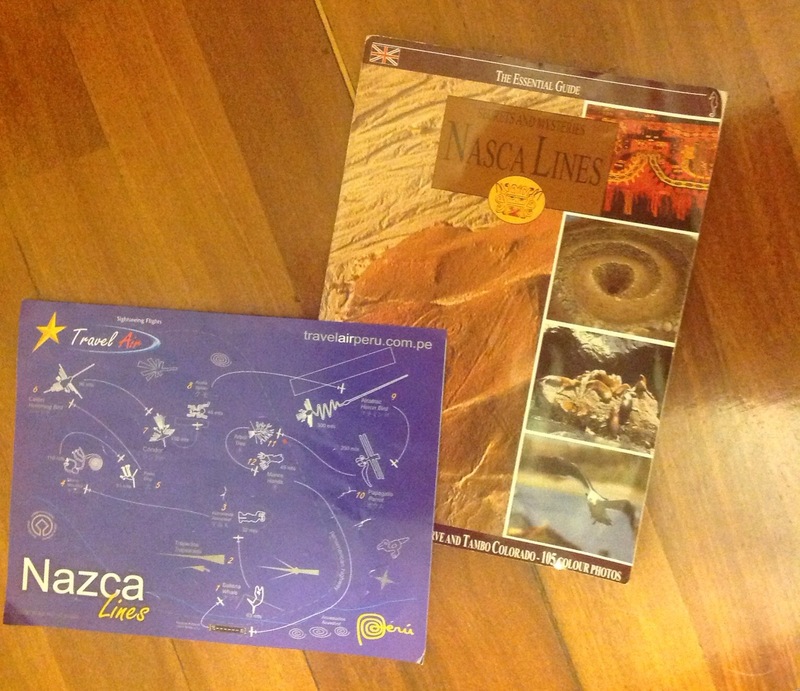 We also covered the pre-Incan cultures of Peru. 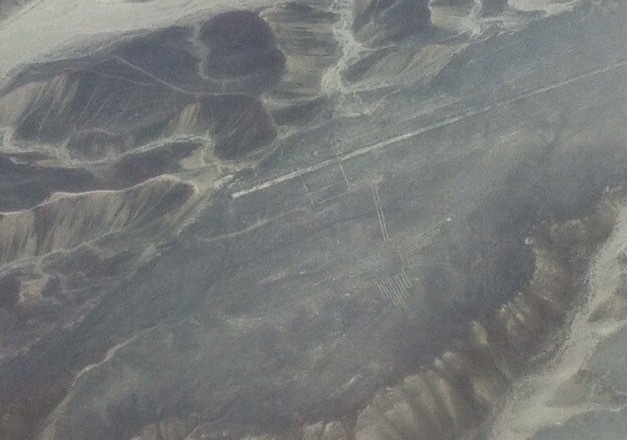 We organized a driver to pick us up from our apartment in Lima to drive us to Nazca. The 450 km journey takes about 5 1/2 hours, so we left at 5 AM. 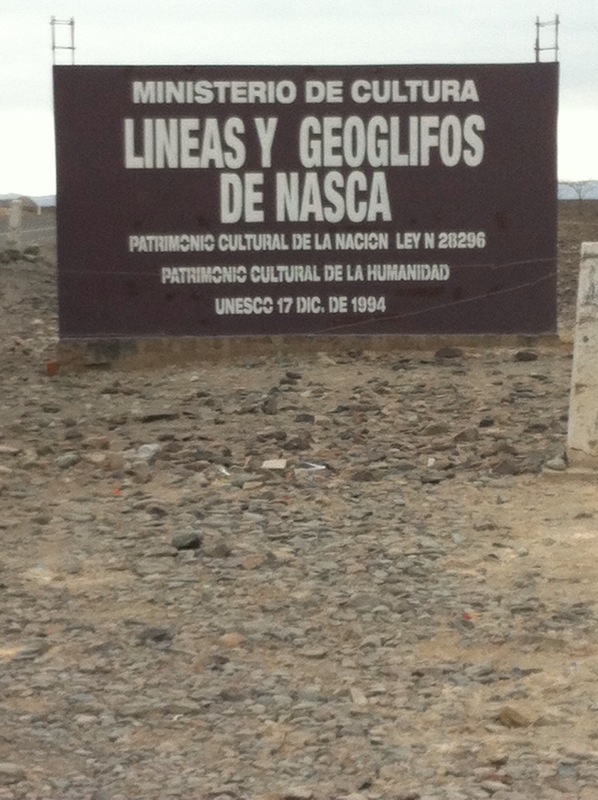 The route took us through Pisco, of the famed liquor, used in the Pisco sour. The towns, traffic, and desert along the way reminded us of our travels in Rajasthan, India, right down to the tuk tuks. 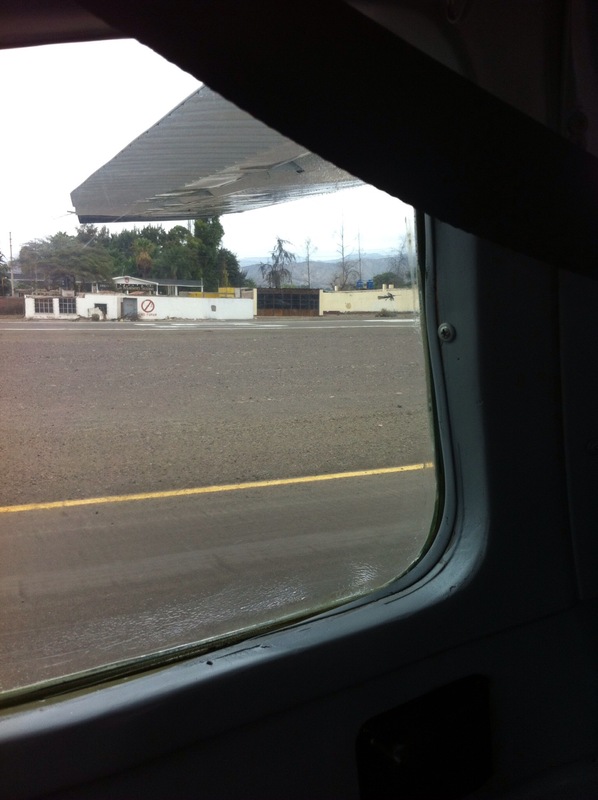 Arriving at the Nasca airport at 11:30, we met our pilots and boarded the Cessna C206. 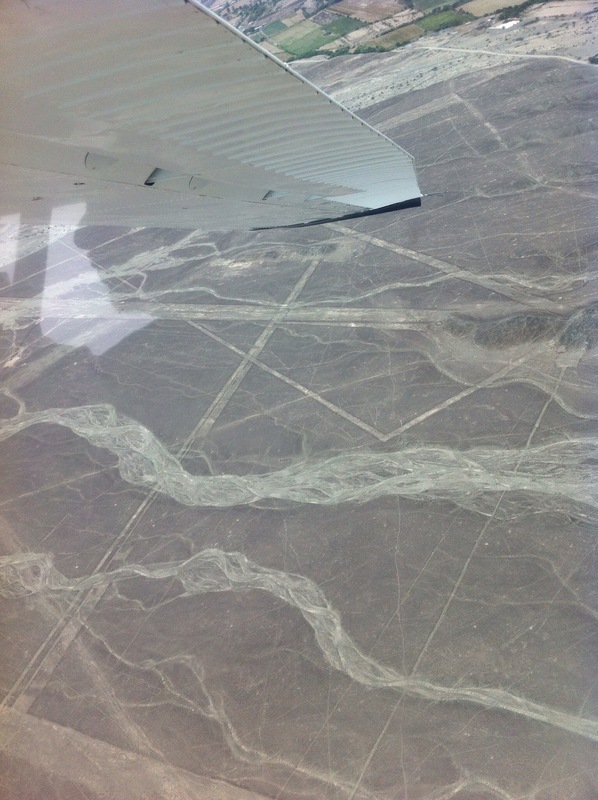 We each had a map of the lines and a camera ready to go for the 30 minute fly over. Once boarded, Boy decided he would prefer a big jet plane to the little propeller aircraft and spent the flight in Mom’s lap with his eyes closed. Mom and Dad enjoyed the flight anyway, snapping pictures and trying to spot the figures. After a quick lunch, we climbed an observation tower alongside the highway for a final look at the lines before heading back to Lima. It was well after dark when we returned, tired and ready for sleep.